Registraciones de verano ahora abierto! 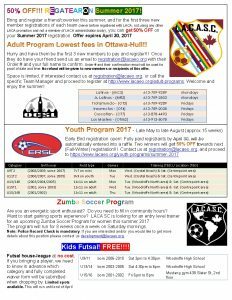 Summer registrations now open! Just a quick note about our presence at the 1st Youth Sport Expo show at the Bell Sensplex in Kanata. We will have a booth there both days Sat and Sun. There are many other exhibitors, all related to Youth Sports in Ottawa. You can get 50% off an entry ticket with the code YSE50off entered here to purchase and print tickets. ZumbaSoccer for Women: we are evaluating the possibility to start this on Saturdays as well, while the youth do their training, we want the ladies to be able to get into soccer. Fitness drills and games.